In today’s episode, I want to talk about two important topics first, in the thought leader segment, I’m going to share with you how to use the yellow light principle to make sure you uncover problems before they become serious problems. Next, in the coaches mailbox segment, I answer a question from Gino about how to get people to buy into his ideas. Tom: So getting back to your CFO, I would ask, “What did you mean about cloud strategy?” And I’d ask him questions about, “Where did you hear that? What was the context? What benefits do you think we would get from moving to the cloud?” Now your goal is not to cross-examine him or make him seem stupid or catch him being dumb. Your goal is not to look for a way to point out how wrong or foolish the other person is. What you’re trying to do is get an understanding of exactly what he’s thinking. Announcer: Becoming a Geek Leader, season three, episode two. Sponsored by Brighthill Group Executive Coaching Services. CEO Whisperer Jerry Colonna said, “If you’re not consciously, intentionally creating your culture, culture’s going to get created around you or despite you.” I work with leaders and their team members to help create a positive culture. Sometimes this is by coaching one or more high potential team members to help them develop the skills to create the environment for their teams. Other times I’m brought in to work with someone who needs help getting back on the path. If you’d like help creating a great culture, developing your team members, or even taking your leadership to the next level, check out brighthillgroup.com/go/coaching. That’s brighthillgroup.com/go/coaching. I offer individual and small business rates. Let’s get started. As I kick off today’s episode, I want you to know how much I appreciate you. Thank you for listening. I am grateful to be in touch with you and also to be able to hear from you. So if there’s a topic, a question or a concern you have about the podcast, please reach out to me. Send an email to coach@brighthillgroup.com. That’s coach@brighthillgroup.com. I really do love hearing from you. In today’s episode, I’m gonna talk about two important topics. 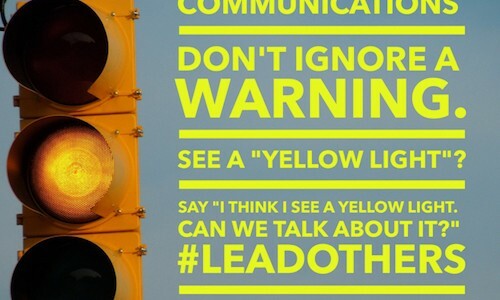 First, in the Thought Leader segment, I’m gonna share with you how to use the yellow light principle to make sure you uncover problems before they become serious problems. Next, in the Coach’s Mailbox segment, I answer a question from Gino about how he can get people to buy in to his ideas. Let’s get started. Tom: I recently was reminded about a fantastic book on the topic of collaborating with others to solve complex problems. And in today’s thought leader segment I’m gonna be sharing with you one of the ideas from that book. The book is called “Let’s Get Real or Let’s Not Play.” And I really love the way the authors tackle the problem of getting a diverse set of ideas from people and getting people on the same page. I highly recommend the book. In this book, one of the ideas that the authors Mahan Khalsa and Randy Illig share is the idea of a yellow light. Now, a yellow light is something that you can use when you’re at level two of the four levels of thinking as a geek leader. Announcer: Level two, team member. Level two is where you work well with others, and together you all succeed. Tom: Now, let’s talk about the yellow light principle. We all know that when we’re driving and we’re approaching a traffic signal and we see a light turn yellow we have two choices. We can choose to accelerate in hopes of beating the red or we can slow down in case we have to stop. Now, none of us likes to stop. Nobody likes to be held back, and so our tendency tends to be we want to speed up when we see a yellow light. Now this can be disastrous when it comes to working with a customer to define a solution. And a red light is something that is going to be ultimately a showstopper. It’s a problem that is a major issue or it’s something that cannot be overcome, a requirement that cannot be met. That’s a red light. For example, I worked years ago on an identity management project for a large company. The company was growing and we needed to be able to add new users, remove users, and modify permissions for users on systems throughout the entire organization. Now, this area was a new area for us to tackle, and we were working with a small vendor who is nimble and agile and promised to be able to solve the problems for us, and so we were excited about that. But after investing years and millions of dollars in this project, we finally had to pull the plug. That project died a painful death. Looking back, as is often the case, we really didn’t understand a lot of the complexities about the business and the business rules that we were trying to implement. And it was only when we began to try to build a system that automated those business rules that we really dug in and could figure out how complex the problem really was. As I reflect on it now, I think we were overly optimistic about how simple it would be to solve the problems and we were overly optimistic about the vendor’s capabilities. Now, knowing what I know now, we overlooked a lot of yellow lights that really ended up being red lights. Now, when it comes to red lights, I want to point out that finding a red light is not a failure. Getting a red light, if something’s going to fail eventually anyway, you want it to fail fast. If the project is ultimately going to fail, you succeeded when you get it to…when you learn that early, when you get it to fail early. Because pouring more money into a project that’s ultimately gonna fail is an even bigger loss. Now, this yellow light principle. The idea here is that we’re gonna recognize things that might become a problem, and we’re gonna bring it up as early as possible. The earlier we discover problems or even potential problems, the cheaper and faster it is to solve them. feeling and what they’re thinking. Now, I know a lot of us are not really touchy feely and it’s hard to connect with that. But so much of the work that we do is related to that EQ, that understanding that emotional connection that needs to happen with people and cultivating your awareness of that is really, really valuable to you. Now, the customer is gonna give you signals about what matters to them and they’re gonna give you those signals in the inflection that they use or their emphasis or in their pace or their tone. These are all things that are not what they say but how they say it. Of course, you want to listen to what they say. Of course, that matters, but it also matters how they say it. And as you are paying attention to their inflection or their tone or their emphasis or their pace, they’re gonna give us also non-verbal communication. How are they standing or sitting? How are they…? What facial expressions are they making? All those give you a clue about what’s going on inside their head. As you begin to learn to be aware of those signals, then you can choose what you’re gonna do with them. As you look at that list, a yellow light is anything that might give you a clue that something is not working perfectly, and that’s what we’re talking about. The value in this approach is you’re really beginning to collaborate with the customer and you’re getting a sense from your customer about what really matters to them. I want to take just a second here to remind you that it’s not our job to implement technology X, whatever our favorite technology is. Of course, we should be experts at what we do. Absolutely, that’s right. Of course, we should use our technical talent to create elegant systems and solutions for our customers. But fundamentally, fundamentally, our job is to help customers use technology to solve business problems. We’re not in the technology business. We’re in the solve business problems business and we happen to use technology to do that. And when you, on your levels of thinking, are able to start to move up the chain a little bit, if you’re able to do more work that helps you understand what the customer wants, you’re going to add more value to the business. And when you think about how to solve business problems using technology and not just how the technical stuff works, your influence is gonna increase and the value it brings to the business is gonna increase. And what that means to you is that you’re gonna find you have more support for your ideas, you have more resources to solve the problems that you face, and your projects are going to be more successful. 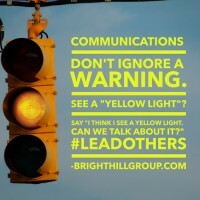 So leveraging the yellow light principle is a way that you can get everybody in the room on the same page and believing and buying into the same idea, and it’s gonna help you identify problems early so that you can tackle them early, and that’s today’s Thought Leader segment. Of course, we can move our stuff to the cloud. The problem is not moving the technology to another platform like the cloud. The problem is, all the customizations that are demanded by the people in the line of business and all those people report to the CFO. The answer to this question about how to get people to want to buy into your ideas, how do you gain that buy in, that’s something that you can use starting at level one of the four levels of thinking as a geek leader. Tom: Gino, you asked, “How can I get the CFO to realize his people and his processes are the problem, not the technology?” And I want to tell you, I feel your pain. I remember using…I was responsible for a similar system in a Fortune 500 company, and our business partners demanded that their business processes could not be changed, that the software had to be modified to meet their specific and unique needs because their business process was perfect. And of course, what that meant was we had to make the software do things it wasn’t designed to do and it meant that when it came time to do upgrades, it was really hard. Because of the significant amount of customizations, each upgrade required an extensive test plan for all the customizations and we had a budget to essentially rewrite almost all the customizations too because the vendor didn’t care about our customizations. I don’t think I can really get into the details of your specific situation without more information from you, but I do think I can offer you a few specific principles you can apply as you work your way through this challenge. First, it’s important to note that you’re always safer if you assume that people make bad decisions as a result of ignorance rather than bad intent. Let me say that again. It’s always safer to assume that people make bad decisions because they’re ignorant rather than because they have bad intent. In your case, I’d be willing to bet that the CFO doesn’t understand the cost and complexity related to maintaining custom versions. The tradeoffs required to move to a hosted system like the cloud instead of an on-premise system and the complexity of getting his people to change their business process. Fundamentally, if you want to influence your CFO, if you want him to buy in to your ideas, you’re gonna have to make clear to him why it’s in his best interest to make the changes that are needed. Let me take a couple of minutes to unpack these for you. Number one, what do they care about? Now, you already have some insight. Your CFO told you the goal he’s after is to allow you to make major leaps forward in your capability. Now, you and I both know, we have to be very clear about exactly what we mean. In this case, there are two things I think you need to have clarified before you can move forward. Let’s talk about the cloud. Like most new technologies, this one’s pretty far along in that hype cycle. The term is used frequently, it’s in a lot of literature, it’s in ads, it’s on television commercials, and the challenge is, I think, very few people actually know what it means. I’d bet if you ask five different people what it means to be cloud-enabled or to be able to work in the cloud, you’d get at least three different answers. You might get six. If I were in your shoes, I’d want to sit down and ask the CFO, “Why are you interested in cloud enablement?” and really dig into that. And then next, in your question, Gino, you said that the CFO said, “Major leaps forward in our capability.” Again, I’d want to sit down with a CFO and ask for specific examples of times where he wanted some new capability and he hasn’t been able to get it. When you understand the driving factors behind his request, you’ll be far better equipped to make a case that’s gonna resonate with the CFO. You’ve already said that based on your experience, unless the business process is simplified, the promised efficiencies of moving to cloud probably won’t happen. You may not even be able to do the things you do today in the cloud. And I just want to say that while this may seem obvious to you, it is very likely not to be obvious to your CFO, so this is where you have to say it out loud. In order for your CFO and other leaders to make good decisions, they have to understand the consequences of their choices. Spending some time with them to really understand what they’re after is extremely valuable and it will give you a whole lot of help as you’re trying to make the case about why they should or shouldn’t do anything. Now, you might not actually get an answer to this question. You may or you may not. Now, if you don’t get an answer, maybe he likes the idea of that capability thing but doesn’t really…can’t give you a specific example. Then you can take a run at it from a different direction. You could ask, “Has there been a time in the past that you wanted or needed something that our tool couldn’t do for you? I mean, I assume you asked us to help you with that but we weren’t able to help.” And if he can give you an example, and he probably can, “What was the impact of not having that capability? How much did it hurt you or how painful was it or why was that important to you?” Understanding his motivations and drives are gonna be very valuable to you because you want to really understand his concerns. When he’s telling you his concerns, you’re gonna want to write down the specific words that you hear him using. You want to repeat back exactly what he says. So you’re saying, “You want to be able to get new versions of the software installed faster?” For example, right? And that process of saying it out loud, of repeating it back, that lets the CFO know that you heard exactly what he said. And the reason for writing down the words he uses is that when you are making your case in that future meeting where you’re coming back to talk about which direction you’re gonna recommend the organization go, when you’re making that case, you want to use the same words that he used when you’re talking about helping him get what he wants. And there’s a ton more we could go into on this one point. But if you want other people to buy into your ideas, the key point here is you want to understand exactly what the other person cares about. So that’s point number one, what do they care about? Number two, do you have enough personal connection with them so that they trust you when you speak? Now, I could go into a ton on this one as well. If you want more information about this, you should go back and listen to season one episode, one of podcasts, and I’ll include a link to that in the show notes on the website as well. Also, there’s a resource that I had that will really help you when you’re starting to learn about what’s important to other people. There’s a one-page resource that I’ve got that you can download that is called “My favorite things,” and it’ll help you make that personal connection. So our goal here is connection. We want the other person to feel a connection with us. I just cannot overstate the importance of that personal connection. A lot of times, as engineers, we feel like it’s obvious that our solution is correct. Our recommendation is to be trusted because our competence speaks for itself. That’s our starting point. That’s what we generally believe when we’re getting started, but here’s the thing. It doesn’t actually work that way. It is important that we be competent. Of course, we have to be competent, but it’s not enough. Fundamentally, people do business with people they know, like, and trust. Let me just say that again. Fundamentally, people do business with people they know, like, and trust. They expect that you’re competent, but if you want to have influence with them, they have to like you and they have to trust you also. We want to be in a position where we’re able to connect with the other person on some common ground. Connectors connect on common ground. Now, we started talking about…technically, we started talking about what do they care about, what outcome or result or solution do they want. That’s on the technical side, and I want to talk about, personally, what’s going on because we have to get a little more personal. I’ve watched my mentor John Maxwell for many years as he does this. He’s always intentional about finding some common ground. What’s interesting to me is, he can be on a conference call with a thousand people and there’ll be a Q&A session going on and somebody will come on and they’ll say, “Hi, I’m Julie and my question is X,” and they’ll ask a question. And here’s somebody that he has never met, he’s never met this person. How in the world can he have connection with somebody he’s never even met? But before he answers the question, he takes a moment and he asks her a question. John will say something like, “Hey, Julie, where are you from?” Now, in John’s case, he’s been speaking and teaching for probably 50 years. He’s traveled all over the world, and invariably, no matter where Julie lives, John will be able to say something like this, “Oh, you live in Scranton? You know, Julie, I remember I visited Scranton several years ago. I was doing a speaking engagement there. There was a deli down on Main Street that I really liked. Have you ever eaten there?” And all of a sudden, he’s gone from a totally cold, totally disconnected relationship, to sharing something he has in common with her. Now, he might not bring up a specific detail like that because, candidly, he probably doesn’t remember the details like that. But he might say, “I do remember I visited Scranton a while back when I had a speaking engagement.” Orm maybe he’s never been to Scranton and he says, “You know what? I spoke in Philadelphia a while back. How far is that from Scranton?” He’s talking about what matters to her, And even if he hasn’t been to her town, he has brought something up that does matter to her. He’s established some common ground, and that’s somebody he doesn’t even know. Now, in your case, you want to find something that you have in common with the other person. You want to find something that you and that person can agree on. Maybe it’s a sports team. It might be something academic. It could be anything at all. Connectors connect on common ground. If you want to influence somebody else, if you want to win them to your way of thinking, you need to find common ground. Look around their office. Look at the bumper stickers on their car. Listen to them as they tell a story about their family or their dog or their car or anything else. Making a priority of finding common ground matters. If you can find something that you can relate to, it’s important. By focusing on what’s important to them and you’re making that personal connection, that’s going to make them more likely to want to hear what you have to say, and you don’t have to have a 20-minute conversation about rock climbing. You can have a one-minute conversation about it. You’re just trying to find some common ground you can stand on. That’s how you go about winning somebody to your way of thinking. So we’ve talked about what do they care about and we’ve talked about do you have enough personal connection for them to want to hear what you have to say, so let’s talk for a second about number three. Connectors do the difficult work of keeping it simple. When I think about this topic, my head begins to spin. This is so important and it is very, very difficult. In fact, the more you know about a topic or a subject, the harder it is to be simple. As I mentioned before, even widely used words like cloud are not simple because people don’t even agree about what they mean. This problem is so widespread in multiple organizations where I worked. I found it valuable to create a glossary of important terms. People would use acronyms and terms and words that meant something specific to them and I was shocked at how often people in the organization actually disagreed about what those things meant, and we would spend time making sure that we were on the same page. Because if we were talking about different things, of course, we were not gonna be on the same page. We weren’t gonna get to great solutions. So I literally would create a Word document that was a glossary of terms and what we meant by those terms. So getting back to your CFO, I would ask, “What did you mean about cloud strategy?” And I’d ask him questions about, “Where did you hear that? What was the context? What benefits do you think we would get from moving to the cloud?” Now your goal is not to cross-examine him or make him seem stupid or catch him being dumb. Your goal is not to look for a way to point out how wrong or foolish the other person is. What you’re trying to do is get an understanding of exactly what he’s thinking. And once you know where his thinking is, you can start to do the difficult work of keeping your communication simple as you translate from the terminology that you would naturally use to words that make sense to him. I just want to take a second here to say it’d be ideal if the CFO and other leaders were willing to do the hard work of understanding the technology terms but that’s not gonna happen. It’d be great but it’s not gonna happen. So you’re gonna find, you’re gonna be far, far more successful if you do the work of translating from your native tongue, from the technology speeds and feeds, into terms that are relevant to the other person. This is why you wanted to write down the words that the CFO was using when he was describing his problems, when he was describing his goals, because you’re gonna want to find a way to translate your words and your acronyms and your ideas into a language that makes sense to him. You simply won’t get what you want if you don’t communicate what you want simply. You simply won’t get what you want if you don’t communicate what you want simply. Connectors do the difficult work of keeping it simple. So Gino, I know you’ve got a lot of hard work ahead of you and I hope these three ideas are helpful to you in your process. When you want to get others to buy into your ideas, you need to know what do they care about, do you have enough personal connection with them, and have you done the difficult work of keeping it simple for them? And that’s today’s Coach’s Mailbox segment. Tom: In today’s episode, we talked about the concept of a yellow light and we also talked about how you get buy in for your ideas. We talked about how you need to know what they care about, how you have to have a personal connection with them, and that, as a connector, you need to do the difficult work of keeping it simple. For today’s Episode Hack, I want to talk about how you can immediately use the yellow light principle. In the book, “Let’s Get Real or Let’s Not Play,” they say, “If you feel it, hear it or see it, find a way to say it tactfully. If you feel it, hear it or see it, find a way to say it tactfully.” Remember the three-step response. One, “I think we may have a problem.” Two, state the issue tactfully. Three, ask them, “What do you think we should do?” If you make the time to bring up a yellow light, you might find it immediately turns green or it might turn red. Either way, you’re far better off, and that’s today’s Episode Hack. Hey, can I ask you something? Did you hear something helpful on today’s episode? Why not share it with a friend? On my iPhone, it’s as simple as hitting the three little dots on the bottom right of the screen, selecting “Share Episode,” enter your friend’s email and hit Send. Why do this? Two reasons. One, your friend or coworker will thank you. You’ll be seen as a source of helpful and valuable information and they will appreciate you for it. And number two, I need you to help me get the word out about this podcast. I’m working hard to bring great ideas and great content to you and it’s a big help to me if more people hear those ideas. Go ahead. Share it now. I’ll wait. Thanks.